Proactively Protect Your Prostate Health with Prostara! Our Powerful Combination of Herbs and Nutrients Was Scientifically Developed to Maintain Optimum Prostate Health and Support Good Hormonal Balance to Provide Multi-Symptom Relief! Are you making several trips to the bathroom each night? Are you over the age of 50 and worried your symptoms may be due to an enlarged prostate? Do you feel as though you can never completely empty your bladder? Is it difficult to start urinating, or are you experiencing weak stream? Do you run to the bathroom more often than you'd like or frequently experience sudden urges to urinate? Do you find that you need to strain during urination or that your stream stops and starts several times? Why is Prostara the Most Effective All-Natural Prostate Health Formulation Currently Available? The Most Potent Natural Prostate Health Supplement Currently on the Market! 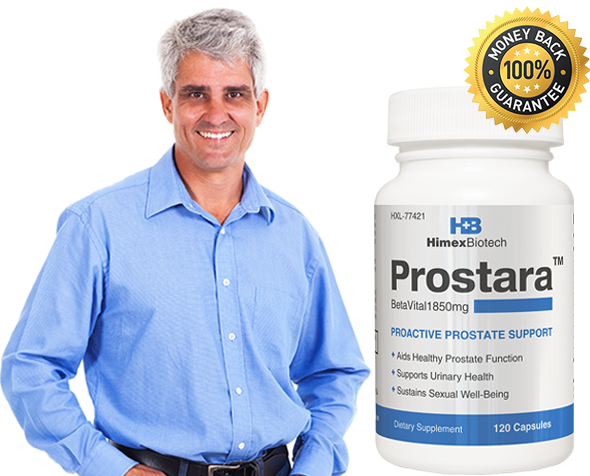 Certain key ingredients in Prostara are promoted and sold as prostate health supplements. If a single ingredient in the proprietary Prostara blend can give men noticeable results, think about what is possible with ten powerful compounds that were specially selected for their ability to maintain and support urinary, hormone, and prostate health! * After you've had some time to shop around and explore your options, we think you'll agree that no other prostate health supplement currently on the market is as complete or as powerful as Prostara! Address unpleasant urinary symptoms instead of putting up with them or trying to ignore them, fight free radicals that can contribute to cellular damage, and promote ideal hormonal balance. Thanks to Prostara one product is all you need to maintain your prostate health and address the physical issues that are keeping you in the bathroom instead of out in the world enjoying all life has to offer!